We learned, with the help our bilingual student, that we would be planting a small section of rice and if we did a good job, we could plant more. Our host explained that if we messed up too much, it would be detrimental to the village. “For the Karen, rice is life,” said our host in English. The next morning we wore clothes that we didn’t mind getting muddy and donned plastic ponchos since it was already sprinkling. We were given instructions to meet our host in the rice field at 9 am. He had presumably been up since 5 am like the rest of the village, but he was kind to us lazy foreigners who like to sleep in. We headed up the dirt road, made the right hand turn as directed, became unsure about whether we had made the correct turn, then found the appropriate rice field. Our host was excited to see us and led us immediately to the rice paddy. Before us lay a terrace of rectangular sunken fields. Each field was surrounded by raised banks of dirt. The centers were being filled with water by an system of pipes. The highest level was filled first then water ran down to each lower level. As we stood staring at the water running down into the empty fields, our host grabbed a bundle of “baby rice”, which looked like long grass tied together. He began pulling off 5 – 10 stems at a time and pushing them into the water-covered mud. His movements were smooth and quick. Then he handed each of us a bundle and indicated that it was our turn. We slipped off our shoes and stepped gently into the squishy mud. I carefully pulled apart a section of the baby rice, bent over, and plunged the tiny plant through the water into the mud. I wondered if I had done it right. I didn’t want to mess up the village’s rice crop. The plant stayed mostly upright, so I tried again. And again, and again. Soon I had planted a small row of rice. 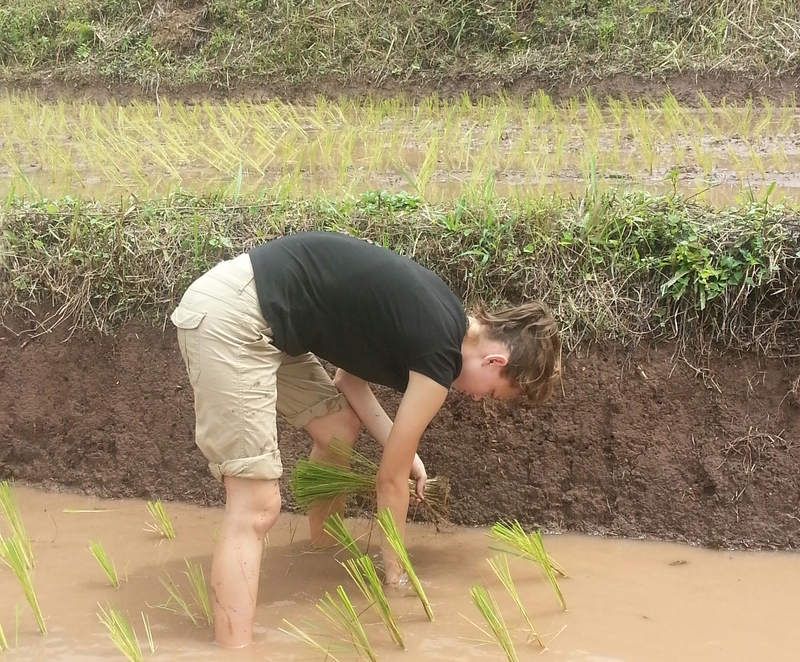 My movements were jerky and my spacing wasn’t as nice as our hosts, but I was getting the hang of it, especially after I figured out how to move forward without stepping on the planted rice or making holes with my feet where I needed to plant the next row. Mud splashed on our ponchos as we worked. Our host became concerned when our hoods came off and our heads got wet from the rain, but we didn’t care. We were already standing in water and the plastic ponchos kept the heat in and made us sweaty. Eventually the five of us planted half a rice paddy. We were so proud until we noticed that a little old lady had planted the other half all by herself in the same amount of time. Our host looked over our work. “Good,” he said and gestured for us to start on the next rice paddy. We were pleased that we passed the test until our backs started aching. Luckily the rain had stopped and we could take off our ponchos. Again the five of us planted half the paddy while the woman finished the other half. “Lunch time,” said our host. We were grateful for a break. Maybe we were even done for the day. The language barrier created a bit of uncertainty. We enjoyed the lunch that had been sent with us, rice packed in a banana leaf, and fried chicken. Afterwards, we rested until we were told what we would be doing next. We hoped the other people at the rice field that day weren’t laughing at us as we laid in the raised hut after eating lunch, groaning about our aching backs. 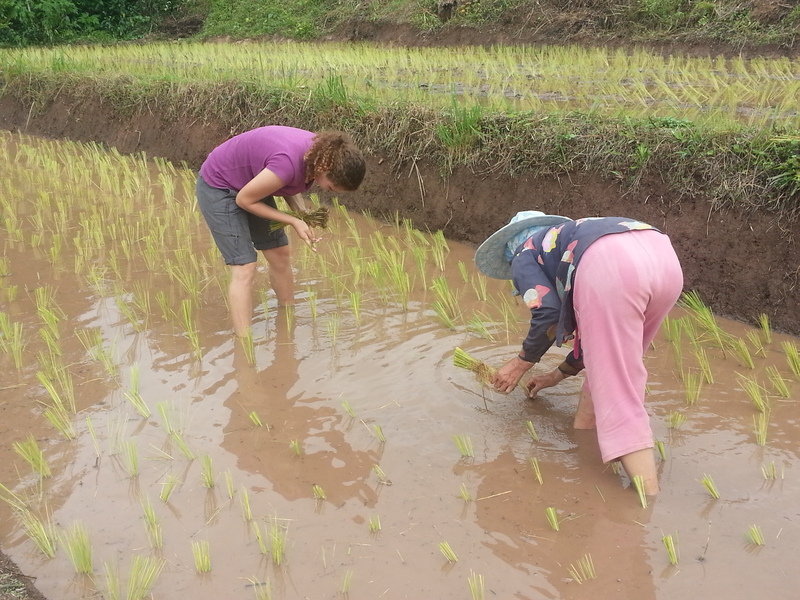 Eventually, we went back out to the field to plant more rice. By this time Arwen was getting really good at it. She could almost keep up with the older woman. Arwen loved walking through the sticky mud in her bare feet. She didn’t even mind the dead critters in the water. I had been ignoring the dead bugs floating in the muddy water, but when the girls also found dead frogs – ick! – I had to try not to think about it when I stuck my hand into the mud. After we finished this round, our host said we could be done. We tried not to show too much excitement on our faces. 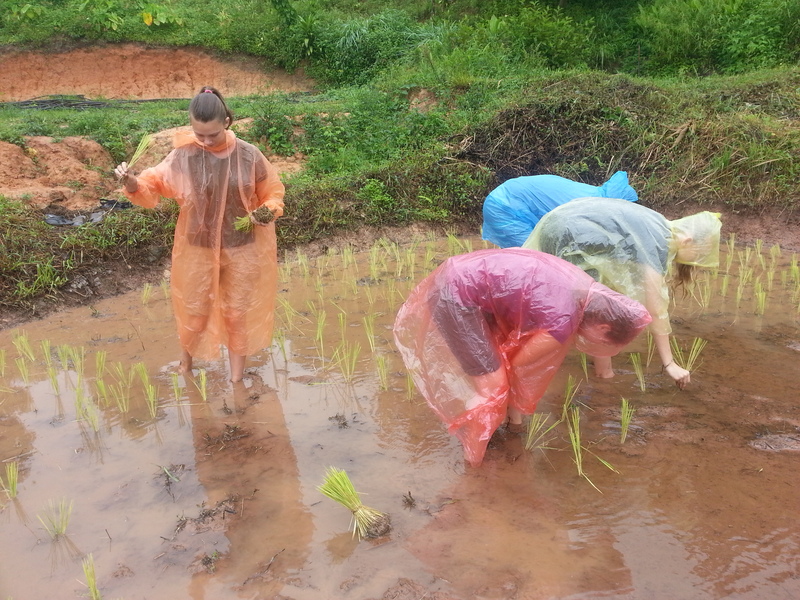 It had been fun to plant rice and walk around in the skwooshy mud. But we were tired and sore. It had been eye opening to see what goes into growing rice. Knowing that each stalk of rice had been planted by hand made us appreciate each grain of rice we ate. And gave us more respect for hard work involved in providing food for the village.